Chemistry graduate student Erica Baker (left) talks career aspirations with Brittany Vacchiano, a Computer Science alumna and Chicago-based web developer. 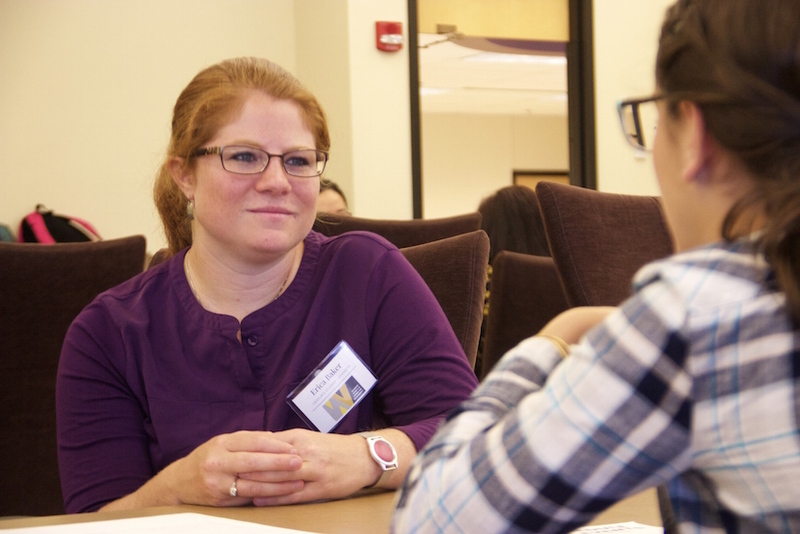 The College of Science was a proud half of the Women in Science and Management event Sept. 9, which saw several alumnae return to campus to meet, network and inspire students. 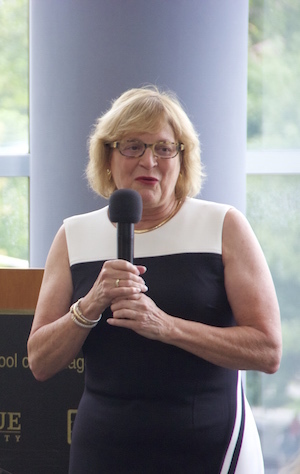 Physics and Astronomy alumna Celeste Bottorff talks about her successful career during the Purdue Women in Science and Management event. Along with Krannert School of Management, several sessions and talks were spread across Lawson Computer Science Building and Rawls Hall. The morning started with speed networking. Undergraduate and graduate female students spent a few minutes each with several successful Science alumnae like Chicago-based web developer Brittany Vacchiano (Computer Science), retired research and development chemist Mona Quintanillla (Chemistry), Dr. Susan Kindig from Indianapolis (Biological Sciences), Dr. Catharine Barth (Biological Sciences) and more. The younger women talked about their career aspirations while the professionals gave them tips, advice and encouragement. The event put the alumnae in the spotlight during the afternoon. Physics and Astronomy graduate Celeste Bottorff talked about her years at Fermilab before earning her Master of Business Administration degree and easing into industry. She had successful stints at Coca-Cola, McKinsey & Company, and, most recently, at Hire Dynamics. “Science and business definitely belong together,” said Bottorff, who now lives in Atlanta. “I still liked the science stuff, but I met some General Electric guys, went on a tour of their major appliances facility and by the end of it, they offered me a job. … They were bringing in a bunch of new technology and robots, and I learned, took night classes. After Bottorff’s talk, the day concluded with an interactive panel discussion under the theme “Hammer Down the Glass Ceiling.” Quintanilla and Kindig were joined by Krannert alumna Toby Emerson, vice president for global education with Marketo. Students in attendance asked questions and benefited from alumnae all day. 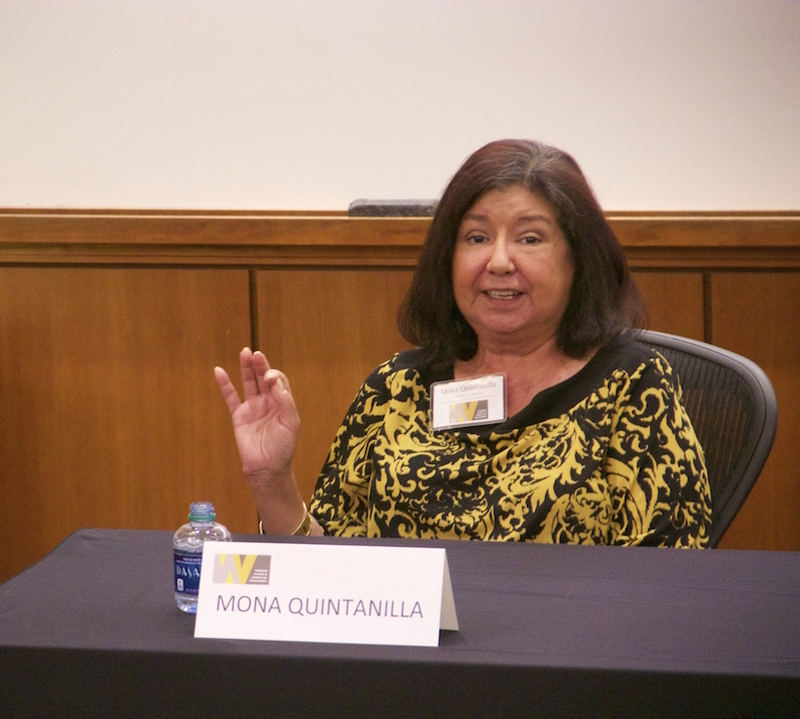 Chemistry alumna Mona Quintanilla makes a point during the "Hammer Down the Glass Ceiling" panel discussion.